In a major revelation, the new National Sample Survey Organization (NSSO) report, “Key Indicators of Drinking Water, Sanitation, Hygiene and Housing Condition in India”, released in December 2013, has found that Gujarat’s performance in providing sanitary and hygienic conditions to its rural population is not progressing well enough. In fact, if the data are indication, Gujarat’s performance on this score cannot be said to considered “vibrant” in any sense. The NSSO survey data suggest that Gujarat is an average performer, especially on issues related with sanitation. If the report is to be believed, a whopping 58.7 per cent of the rural households of Gujarat have no access to toilets – which means that majority of the rural population goes into the open for defecation. If the report is any indicator, as many as 10 out of 20 major states selected for analysis have a lesser percentage of rural households without toilets. 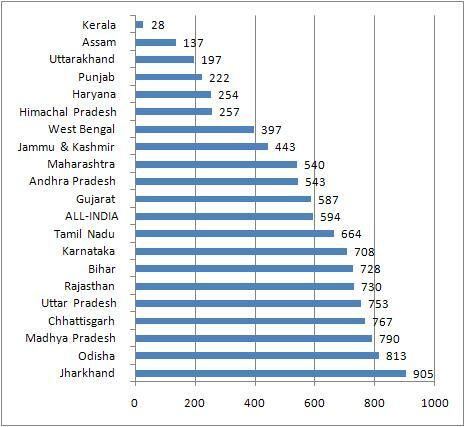 These are Kerala (2.8 per cent), Assam (13.7 per cent), Uttarakhand (19.7 per cent), Punjab (22.2 per cent), Haryana (25.4 per cent), Himachal Pradesh (25.7 per cent), West Bengal (39.7 per cent), Jammu & Kashmir (44.3 per cent), Maharashtra (54.0 per cent), and Andhra Pradesh (54.3 per cent). 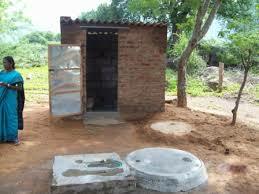 The all-India average of households without toilets is slightly better than Gujarat’s – 59.4 per cent. Lack of toilets, if analysts are to be believed, indicates that manual scavenging is widely prevalent in rural Gujarat, as in other parts of India. Further, the survey found that 53.9 per cent of the rural households had no bathroom facility attached to the dwelling units, which again is worse suggests poor sanitary conditions in rural areas of the state. Here again, it is worse than as many as nine out of 20 major Indian states. The states with lesser percentage of households with “no bathrooms” within the dwelling units are Kerala (9.7 per cent), Haryana (14.4 per cent), Uttarakhand (20.5 per cent), Himachal Pradesh (31.7 per cent), Jammu & Kashmir (40.5 per cent), Andhra Pradesh (45.4 per cent), Assam (45.6 per cent), and Karnataka (48.1 per cent). The all-India average for no bathroom facility within rural dwelling units is 62.3 per cent. Data suggest that only 26.1 per cent of the rural households had access to drainage facility, as against the national average of 31.7 per cent of the rural households. The rural areas of the states with better drainage facilities attached to their households are Haryana (81.7 per cent), Punjab (79.3 per cent), Uttar Pradesh (49.5 per cent), Karnataka (43.3 per cent), Maharashtra (43.0 per cent), Uttarakhand (42.5 per cent), Andhra Pradesh (42.2 per cent), Kerala (41.3 per cent), Jammu & Kashmir (34.2 per cent), and Tamil Nadu (29.0 per cent). The all-India average on this score is 31.7 per cent. Thus, the survey finds that in Gujarat 17.1 per cent of the rural households do not have any direct opening towards roads. 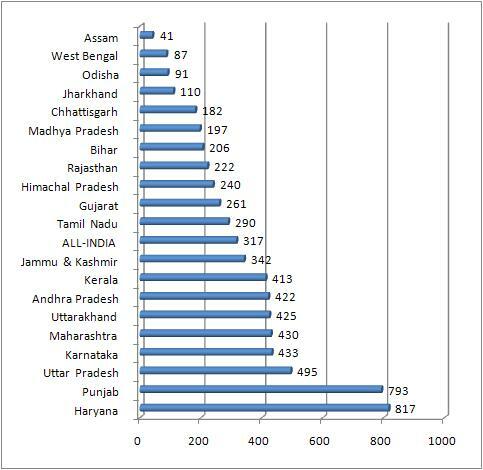 While Gujarat scores worse than the all-India average, which is 14.6 per cent rural households having no direct opening to roads, the state is found to be a better perform than only six of the 20 major states of India – Uttar Pradesh (18.7 per cent), Bihar (20.1 per cent), Jharkhand (20.6 per cent), Himachal Pradesh (27.5 per cent), Uttarakhand (27.6 per cent), and Jammu & Kashmir (36.7 per cent).